My husband and I had just lost our cocker spaniel mix, “Bo Jackson”, who we LOVED for 14 1/2 years. We had spent 3 months depressed and still mourning our loss. I had my husband take me weekly (every Sunday) to Centre Paws, a local rescue shelter, just so I could pet each of the dogs up for adoption and then leave. I was not ready to adopt another dog but needed to see them. After a two week hiatus (vacation), we arrived Sunday afternoon at Centre Paws for the usual rounds. On this particular visit, I went around to each dog for a pet. There were other “potential” adopters checking out the dogs available. A pretty coonhound started “kissing” me but I continued on until I pet each dog. As we were about to leave, I looked over at the coonhound again and her eyes pleaded for another pet. I went back over and she continued “kissing” me. I noticed she did not do that with the other potential adopters. I asked about her and was told she was a sweet dog but had already been “recycled” back by two different families due to her “separation anxiety“. I went back to the car and asked my husband what he thought about the coonhound. He said she was OK and drove us home. 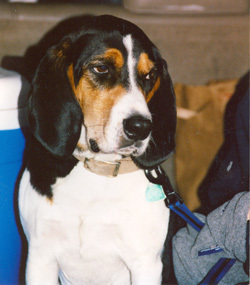 Immediately, I checked on the website to see a picture of “Copper” the coonhound. At this point, my husband knew where I was going with this and told me to inquire about Copper. Copper is doing well. She slowly was able to get over her major separation anxiety, and she is the sweetest, most lovable dog (now I get kissed every day!). Today, is her 6 year anniversary with us (steak & cake day!) She is always VERY happy to see us and it feels as if she was hand-picked for us. We are all very happy together!